St. 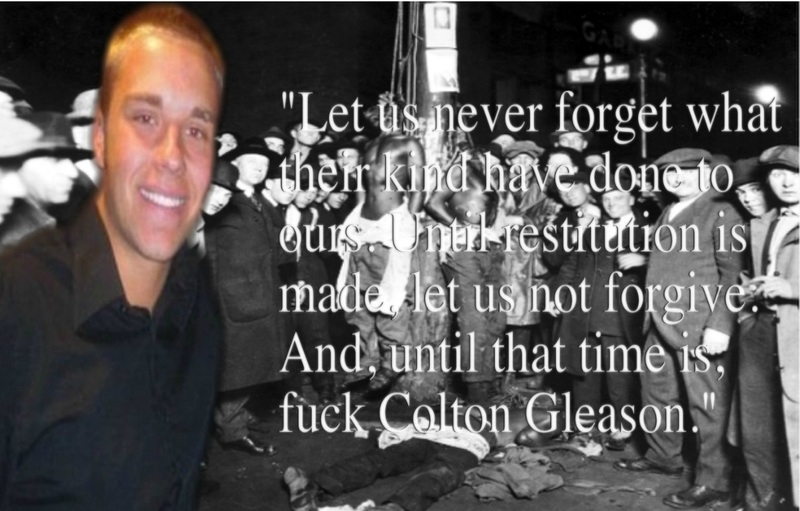 Cloud and Minneapolis Black Foot Soldiers have issued a joint and scathing condemnation against twenty year old reparations offender Colton Gleason who was killed in an apparent and single blow by Divine Race Karma. “Racial terrorists like Colton Gleason have assaulted our people through Trans Atlantic Slave Trade (TAST) reparations denial without regard for too long. We can only be thankful that seventeen year old Jesse Smithers allowed God to use him and his body to be filled with the spirit of retribution Allah is pouring out across the earth against these unrepentant and demonic savage cave creatures who call themselves part of mankind but reject the universal laws of love, justice and fairness.